The chapter is based on globalization, the companies and countries are becoming international market place, in Japan everything you see there is produced in China and Korea, due to import and export many countries has stop growing. As consumers and firms are rational now, they expect everything in budget now. For the competitive market, the companies have to well managed their prices, to meet the standards one must customize the price and product according to the demands, the products and services should be functional and reliable, for the long term success, company should concentrate on the consumers preferences. The allocation of the equilibrium prices is important. People have preferences and companies have the technologies, Pareto optimal results are efficient in the sense or assumptions that markets should be concerned, no matter how different agent reacts in different prices. The things and resources should be remained, as they are, example natural resources should not be changed. However, in many situations this may not apply, if a firm is monopolistic then price will be effect and if it sells at lesser prices then it will be in competitive market. The market prices are efficient and no one can change the prices. The phenomena of adverse selection, the companies give more benefits to those who pay fair prices. There are formation of preferences, preferences could be affected by the social norms and habits, the convince consumer have more needs, the Pareto efficiency is still ill defined. The marketing also affect the marketing in globalization, because when customer knows that the need the thing they will not miss it. Utilization and consumptions of the customers also depends on their economic activities or budget constraints. However, free market is very active, Pareto, respect the consumer needs and preferences. The theory and limitations of the Pareto model, that under certain assumption, outcome can be competitive equilibrium, the equilibrium of modified economy, in which preferences and technologies are unchanged; prices cannot be changed by one’s economic decisions. 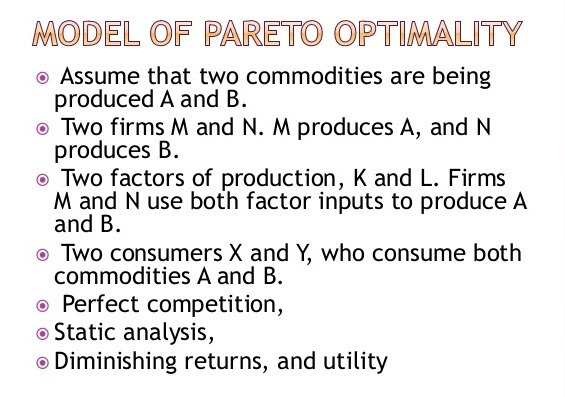 I am inspired by the limitations of Pareto optimality as all consumers are equal, there will be no changes in the prices by one or consumers or the marketers. If one have to get competitive advantage and want to survive in the market then laws should be followed, Pareto is very concerned about the inequality, in free market. There should be equality, fair resources should be given to the rich and poor and value should be given to all consumers. The free market is very effective and efficient, powerful insight should be needed for the assessment. The competitive equilibrium in market power should be measured. The consumer and producers reacts differently about the prices, the lesser prices increase the demand and the higher prices lower the demands, the demand and supply when balance it is equilibrium price, in free market there should be assumptions of competitive equilibrium; in competitive equilibrium the company cannot ignore the prices, which will be beneficial from the consumers perspectives. The product depend on the marginal cost and the market price, the fear of losing money will not allow several agents or marketers to sell products on their own prices. The efficient rely on market prices will be beneficial for everyone and public goods will give advantages to the consumer ad well as to the marketers. 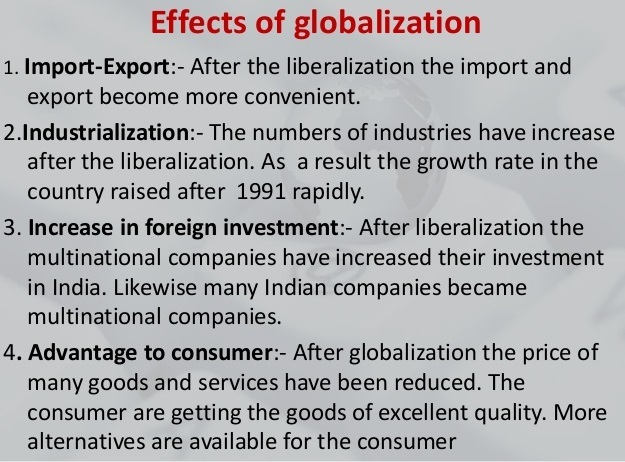 The rules for the free market around globalization, from the Pareto model are very successful and valuable. The effective flow of information will be helpful give sustainable development and globalization. Theory Paradigm is also effective for one to change with the globalization.